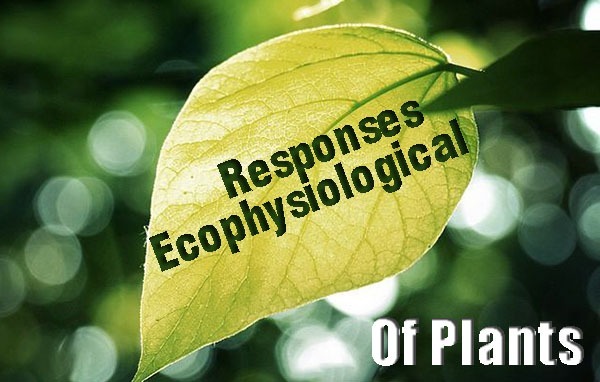 Ecophysiological responses of plants to light are photosynthesis, transpiration, seed germination, photoperiodism, reproduction and growth, and ecological classification. The plant shoots are adapted to receive and absorb sunlight. Most leaves get saturated with only about 20% of full sunlight. Of this quantity about 20% is stored in sugar molecules produced therefore the efficiency is 4%. The dry matter content of the plant represents only 1-3% of the light supply that was available. Leaves in shade produce little sugar since they receive limited energy supply. When a plant is not carrying on photosynthesis. Its dry weight decreases as a result of respiration. The amount of light required for photosynthesis to equal the respiratory use of carbon compounds is called the GHT compensation point. This value is always higher than the absolute minimum for photosynthesis, ranging from about 27 to 4200 L in higher plants. High light intensity promotes transpiration. Light stimulates the guard cells to open and also increase the permeability of the plasma membranes. Of the total light energy reaching leaves about one-third is reflected back and about two-thirds is absorbed, and only small percentage is utilized photosynthesis. it is changed into heat energy and then lost by radiation or used up the vaporization of water. The seeds of most plans become sensitive to light when wetted. In some cases, they germinate whereas in other cases the germination is retarded. Lactuca sativa (salad) seed will not germinate without light stimulation (photoblastic) and Daucus carota (carrot) seeds germinate better with exposure to light. In contrast many Cucurbitaceae germinate better in darkness. The length of duration of light (photoperiod) is important to most plants especially for Inducing flowering. This response is called photoperiodism. Twelve to fourteen hours of daylight is a critical duration for most plants. The plants may be long day or short-day plants according to their requirement of photoperiod. The stimulus is received by a pigment called phytochrome in the buds or leaves and then transmitted to other parts of the plant. In some cases, a single cycle of appropriate photoperiod ‘s enough to start flowering. Photoperiodism help plants to detect seasons. It also affects the distribution of plants. Similarly, it enhances the economic value of the plants, for example at high altitudes beets change to annual mode of life and become useless economically. Photoperiodism helps to check such transformations. Insufficient light suppresses flowering and the vascular plants may remain vegetative indefinitely. Fungi requires light for production of spores. The crops grown for vegetative parts are favored by cloudy climates whereas fruits, grains and seeds are favored by bright sun. The amount of light available to a plant exerts a notable influence on the structure and function of the organs. The process of differentiation is governed by blue and violet wavelengths of light. Plants growing in full sunlight have thick stems, profusely branched, less leaf area per plant and smaller cells in leaf blades, thicker cuticle, fewer and smaller chloroplasts, better developed palisade, longer and more branched roots, etc. Their photosynthetic rate is higher, transpire rapidly, show greater vigor of flowering and fruiting, produce seeds with more calories per gram dry weight, and are more resistant to temperature injury, drought and parasites. Sciophytes: The plants that grow best at low light intensity are known as sciophytes. Facultative sciophytes: Some heliophytes can grow fairly well under shade. They are known as facultative sciophytes. Obligative heliophytes: Similarly, some sciophytes can grow better in full sunlight, these are known as obligative heitophytes.